About an hour later, thirty feet from that spot, I go to the loo and bump into that very man. It’s turns out his company is not DRG but TCB. So two years on, based on an incorrect connection, the same man is in the same place. Now that’s what I call a Coincidence (No. 394)! 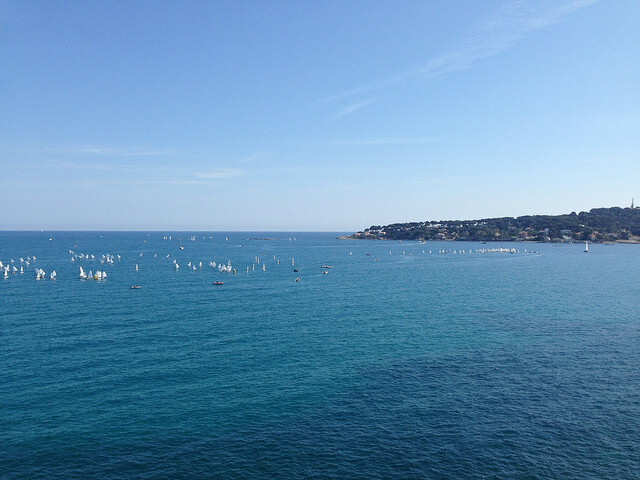 I’m standing on the terrace of the Château Grimaldi in Vieil Antibes (aka le Musee Picasso). Below is an expanse of azure sea punctuated with dozens of white sails travelling in various incomprehensible lines as they race from whoknowswhere to somewhereelse. 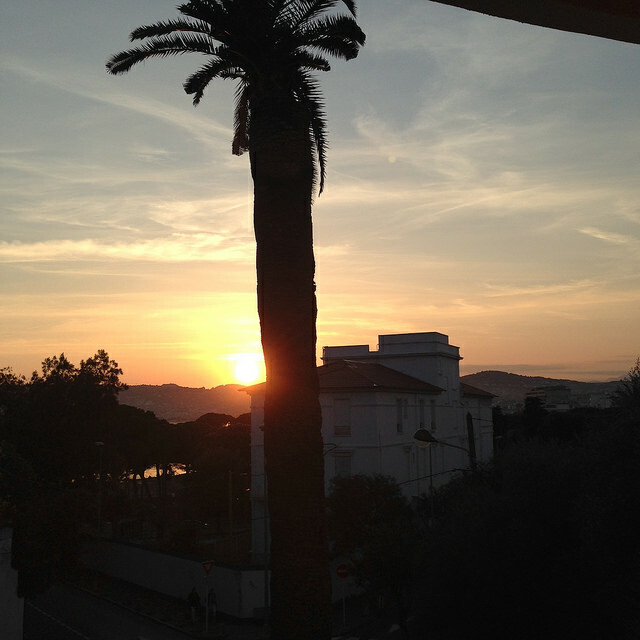 I couldn’t be happier being back in Antibes/Juan Les Pins. I’m here for the MIP TV market/Digital Emmys, my usual reason for being in this neck of the woods, but as a veteran of such things, I know to stay in Juan rather than Cannes. 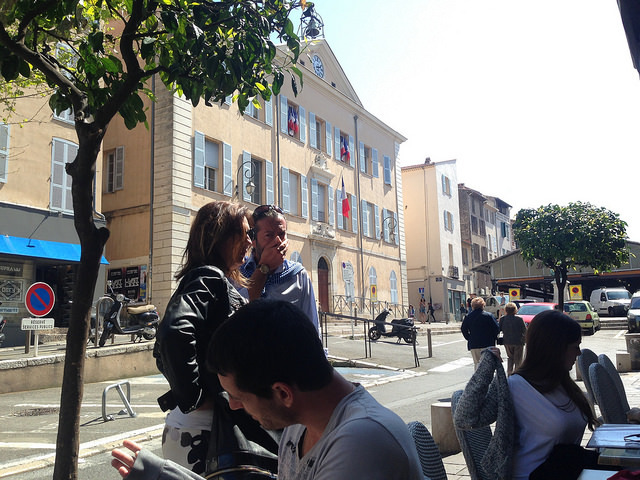 Juan-les-Pins has two particular resonances for me – my European grandparents and jazz. The former, a Germano-Polish alliance, used to come here in the 50s and 60s as it was à la mode, the In place. They both enjoyed gambling so I expect the casino was a significant attraction. The latter I suspect was not unrelated to this modishness as it was the golden age of modal jazz and other such modern experimentation. I’m pretty sure I’ve seen stuff about Miles and Coltrane playing here. This hotel (I’m now on the balcony of my room at Le Grand Pavois as my phone ran out of juice at the end of the first paragraph) has a Sidney Bechet room. Somewhere near the patch of sea I can see through the pines is a commemoration of the international jazz festival they used to hold in town. A quick bit of Googling shows that Trane played at the festival in 1965 and a live LP was recorded, and Miles played here in July 1969. That probably makes the Trane performance within 6 months of the release of ‘A Love Supreme’. A bit more Googling reveals that Coltrane, Tyner, Garrison & Jones (the recorders/creators of ‘A Love Supreme’) were the band who played in Juan on 26/27 July 1965 and they played A Love Supreme, Impressions and Naima, which makes it I believe the one and only live performance of ‘A Love Supreme’, one of my favourite records, the opening track of which I’ve left a request to have played at my funeral (on the way in). Back in the land very much of the living, today has been a pretty blessed one. The taxi driver who picked me up in Nice had a PhD in history of art from the Sorbonne and taught there. Cue interesting conversation about Fragonard, Boucher, etc. The hotel room they put me in is a corner room and because of its odd shape is big enough to play football in and has this huge sweeping balcony hugging the curved corner of the building where I’m now sitting in the golden rays of the evening sun in just a clean white towel (refreshing after the London winter). So I dumped my coat and baggage, changed into shorts and my Save Ferris T-shirt and headed over the hill to Old Antibes. Steak frites for lunch with a glass of rosé. Crêpe citrone and café crême. Reading The Bone Clocks (David Mitchell), my book club choice. Then into the back streets by the marché provençale to the Musée Picasso, like an annual pilgrimage. It’s one of my favourite places. I delighted in revisiting the fabulously Mediterranean ‘Joie de Vivre” (1946) which Picasso painted in the building after the war and about which I’ve written at length. 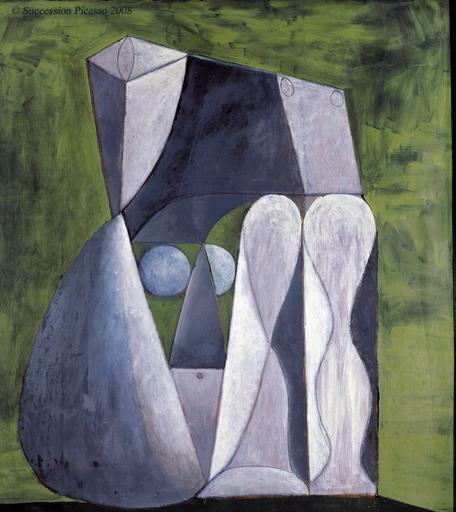 This time the work that really stood out for me was ‘Nu Assis sur font vert’ (1946) which is a good example of Picasso capturing the human body in geometric, sculptural forms. From there I passed a happy hour reading, snoozing, listening on the small harbour beach beside the marina. 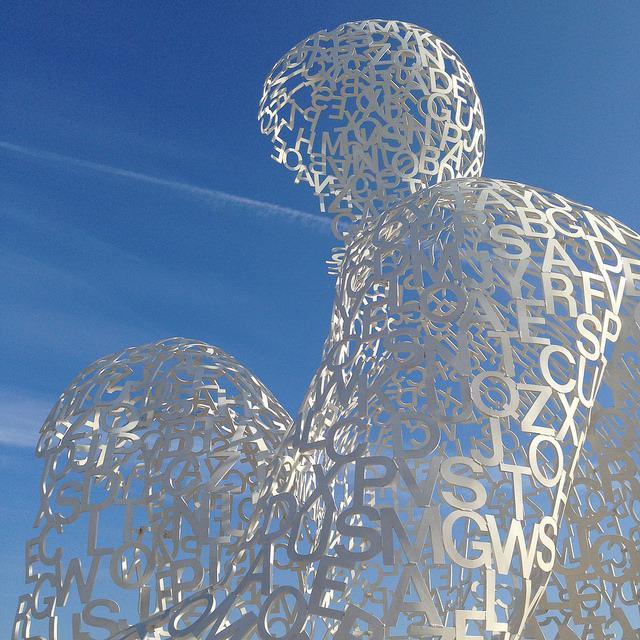 A walk over to Jaume Plensa’s Nomade sculpture (2010) on the harbour wall. Pleasant memories of one of my best days at Channel 4, rounding the corner of a wood to see for the first time ‘Dream’, which Plensa made as part of the ‘Big Art Project’ series. I met him that day. On the late afternoon walk home I had one of the best ice-creams I’ve ever had (rum & raisin and coffee if you want to know). The feeling that came to me walking over that hill on the way out at noon was that for all the crap going on in the world (and there’s no end of it) we need to stay in touch with the joys of living and appreciate them each and every day. That’s the only way to live. Otherwise it’s a road to madness.